By the time the Reverend Benjamin Weir was taken hostage on the streets of Beirut in April 1984, he had lived thirty-one years in Lebanon, where he had taught theology, done charitable work, and spread the gospel. Over the decades, he and his wife Carol came totally to identify themselves with the Muslim Lebanese while at the same time disassociating themselves completely from the U.S. government (so much so, they didn't even know the name of the U.S. ambassador in Beirut). Remarkably, Weir's kidnapping by Shi'i extremists did nothing to change the couple's views. During a March 1985 meeting with Secretary of State George Shultz, Mrs. Weir surrealistically defended the Shi'is as a sincere people with "some legitimate grievances against the United States" and blamed her husband's abduction on U.S. foreign policy. Then, on his release from captivity, Weir held a news conference at which he demanded the U.S. government fulfill his kidnappers' demands. While the Weirs' dogmatism makes them somewhat atypical, many American teachers, missionaries, and aid workers living in Beirut or elsewhere in the Arab world share their outlook: unbounded sympathy for Muslims and loathing for the actions of the U.S. government. 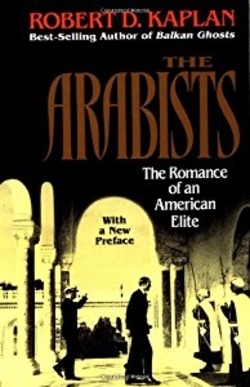 Robert D. Kaplan shows two things about this outlook in his pioneering, fascinating, and important study: that the Weirs are heirs to an enduring tradition of American Arabists which goes back over one-and-a-half centuries; and that tempered versions of their viewpoint have inspired much of American diplomacy toward the Middle East since World War II. The Arabist tradition goes back to 1827 when Eli Smith, an upright Yankee from Yale and the Andover Theological Seminary, took off for the mountains of Lebanon to learn the Arabic language. Within a few years, Beirut had become the center of a remarkable missionary effort by American Protestants. Unlike the British Arabists, who always retained connections to their government, these Americans crossed oceans and braved terrible odds without public support or ulterior purpose; they strove only to bring their vision of Christianity to the Middle East. As Mr. Kaplan notes, "Mission work defines the American Arabist, much as imperialism defines the British Arabist." When it became apparent that few Middle Easterners would accept their faith, Arabists turned to good works - feeding the hungry, ministering to the sick, and establishing schools (notably the American University of Beirut, "probably the most inspired idea in the history of foreign aid" according to Mr. Kaplan). They had a vast cultural and political impact, especially in promoting Arabic as a modern literary language and in incubating the ideology of Pan-Arab nationalism. "America's first foreign aid program" certainly made its mark. Through his readings and interviews, Mr. Kaplan beautifully evokes this exotic outpost of Americans abroad. While staunchly patriotic Americans, the Arabists pursued a strikingly non-American way of life, with households full of servants, a passion for foreign languages, and a singular sense of family continuity. Talcott Seelye, U.S. ambassador to Syria until 1981, is, for example, the fourth generation in his family to serve in the Levant; his great-grandfather arrived there in 1849. Even today, the Seelye tradition persists, as one of his daughters works as a staff aide to Queen Noor of Jordan. This is the elite and the romance of Mr. Kaplan's subtitle. The Arabist impact on U.S. policy dates back to the late 1940s, when Washington first got actively involved in the Middle East. Like their first cousins, the "China hands," Arabists had precisely those skills the Department of State sought: language, knowledge of local culture, useful contacts. The Arabist cohort at State so dominated the Middle Eastern bureau, it managed to absorb many others to its viewpoint, including farmers' children from the mid-West and ethnics from New York City. Trouble was, it also brought strange prejudices to the government, reminiscent of the Weirs'. Bound up in their own small world, Arabists lacked the imagination to understand either the United States or American interests abroad. They loved a pristine Middle East, and regretted its modernization. Against all evidence, Arabists quixotically sought to show the "essential harmony of Western and Arab-Islamic culture." On the negative side, they loathed Maronites and Greek Orthodox Christians, the French, and Iranians ("Scratch an Arabist and you'll find an anti-Iranian"). But most of all, they hated Israelis, whom they blamed as much for spoiling their century-old idyll as for the Palestinians' plight. Washington's increasingly strong support for Israel caused many Arabists to slide into anti-Semitism. As you might expect, Arabists compiled a disastrous record of making policy. The "obsession with the Arabs" that Mr. Kaplan sees as their defining trait repeatedly tripped them up. Carrying old grudges, they refused to see Israel's value to the United States. On occasion, they even took the Arab side against their own government (most notably in 1973, when James Akins, the ambassador to Saudi Arabia, encouraged oil company executives to "hammer home" the Saudi line in Washington). Given a chance to run Iraq policy, they created the ill-fated policy of appeasement that encouraged Saddam Hussein to invaded Kuwait. Fortunately, the Arabist reign in the State Department is nearing its end, as interlopers shoulder increasing responsibilities. Since Joseph Sisco took over the State Department's Middle East bureau in 1969, "peace processors" have steadily gained at the Arabists' expense. The two, Mr. Kaplan shows, could hardly be more different. Peace processors barely know enough Arabic to give directions to a taxi driver. They are hooked not on rugs but on the Arab-Israeli conflict. They love not Arab culture but policymaking. For pleasure, they don't read travel books by sand-mad British explorers but inter-office memoranda. Symbolic of the changing of the guard, two peace processors (Dennis Ross and Martin Indyk) now counsel the secretary of state on the Arab-Israeli negotiations. They're far less colorful than the Arabists, but they also make far better policy. Their dispassion and goodwill made Washington the main force behind the Egyptian-Israeli peace treaty of 1979 and the PLO-Israel agreements of last week. In bringing the Arabist legacy to light, Mr. Kaplan does more than retrieve an obscure aspect of American life. By plumbing these deep waters, he shows why America's connection to the Middle East inspires such strange views and intense passion. It's not just a matter of oil or Israel; devotion to the Arabs is also part of our history. Dec. 21, 1994 update: For a further discussion of Kaplan's book and this review, see "Arguing Over the Arabists."